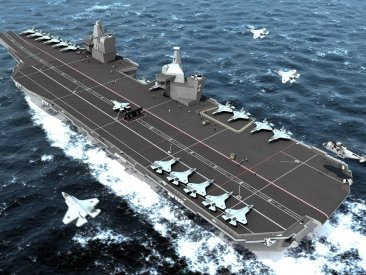 Mostly Daily Thoughts: "Full Range"
"These ships with their aircraft will transform the UK's defence capabilities when they enter service, delivering air power in support of the full range of future operations at sea, in the air and on land." "In dealing with rogue states, diplomacy can never be a substitute for, or even the alternative to, force. It can only be effective as the extension of force- force that is a credible threat because it will be decisive if unleashed, and because it plainly will be unleashed should diplomacy fail. Weapons to be cleared for internal carriage include: JDAM (Joint Direct Attack Munition), CBU-105 WCMD (Wind-Corrected Munitions Dispenser) for the Sensor-Fused Weapon, JSOW (Joint Standoff Weapon), Paveway IV guided bombs, Small Diameter Bomb (SDB), AIM-120C AMRAAM air-to-air missile and Brimstone nti-armour missile; for external carriage: JASSM (Joint Air-to-Surface Standoff Missile), AIM-9X Sidewinder, AIM-132 ASRAAM and Storm Shadow cruise missile. Hi Lord - well thats the rub isn't it? With nukey stuff - anything is weak. OTOH ocean reconnaisance is like literacy rates. Seems like only fun free democrazies got game.